Tokyo - Tokyo stocks fell Friday, led by financial issues, after consumer lender Aiful Corp said it was asking its creditors to delay debt repayments. Investors were already cautious ahead of a five-day weekend in Japan. Stock markets are closed from Monday to Wednesday. The Nikkei 225 Stock Average tumbled 73.26 points, or 0.7 per cent, to end at to 10,370.54. The broader-based Topix index almost flatlined, losing 0.08 points, or 0.01 per cent, to 939.44. Indian Hotels Company Ltd (IHCL), owners of the Taj properties, has acquired Sea Rock Hotel, one of Mumbai’s best-known landmarks since 1978, for Rs 680 crore. Yesterday, the company stated in a release that it has bought 85% stake in ELEL Hotels and Investments, which owns the property on which Sea Rock Hotel is built in southern Bandra, for Rs 680 crore. Tata Teleservices, Country's second-largest CDMA telecom operator, has decided to launch its GSM mobile services under the Tata DoCoMo brand, by end of this month. Tata Teleservices, in which Japan's NTT DoCoMo has a 26% stake, has already invested close to $2 billion to roll out a pan-India GSM network. Country’s second largest telecom operator, Tata Teleservices announced the launch of mobile services on the GSM platform under the Tata DoCoMo brand. Tata Tele would invest $2 billion for rolling out the services across the country under the Tata DoCoMo brand. The service would be commercially rolled out towards the end of this month in the southern states of the country. By the end of 2009, the company will expand services on the GSM platform across the country. Tata Communication, a leading global provider of a communication solutions, has entered into a strategic alliance with Qtel, that will strengthen both companies' network reach in the region and internationally. Under the terms of the agreement, both the companies will align their infrastructures and work together to provide secure, scalable and flexible connectivity solution including Ethernet, MPLS (Multi Protocol Label Switching) and a wide variety of managed services to their global customers. Tata Power, India's largest private power utility, has plans to add 200 megawatts of capacity in the current fiscal year. The company hopes to bring under construction projects on stream, which includes 120 MW unit at Jojobera, a 30 MW unit Haldia, and also around 50 MW of wind power by 2009-10. A company official, who is familiar with latest development, has informed that the company has completed 23% of work at a 4,000 MW facility at Mundra in the western state of Gujarat, and the first unit (at Mundra) is expected to commence its operation by September 2011. Tata Motors, one of the leading automotive companies in India, has witnessed a sharp fall in its net profits for the year ended on March 31, 2009. Lofty interest rates, input price forces, slumping domestic demand for cars and trucks, were some of the factors that pulled down company's net profit to Rs. 1,001.26 crore for the year ended March 31, 2009, against Rs. 2,029 crore in the preceding year. Afcons Infrastructure, a subsidiary of Shapoorji Pallonji & Co., Ltd has received a contract worth Rs 1750 crore from State-run ONGC, to develop an offshore platform. The group, which is also one of the largest shareholders in Tata Sons with its 18.4% equity, has informed that it will execute the contract through a JV with Indonesia's Gunanusa. The offshore platform is schedule to complete by the first quarter of 2011. Apart from this, Afcons is currently acquiring land for the Rs 600-crore oil yard project. The first phase of the yard is expected to be complete by the end of the current fiscal. Tata Chemicals, a leading manufacturer of inorganic chemicals and fertilizers in India, has witnessed a decline of 32.79 per cent in its consolidated net profit, which dropped to Rs 648.10 crore for the financial year ended March 31, 2009. The company was posted a net profit worth Rs 964.40 crore in the year-ago period. Further, the company registered a growth of 87 per cent in its total income, which surged to Rs 12,341.04 crore, compared with Rs 6,607.01 crore in the year-ago period. Tata Realty and Infrastructure Limited (TRIL), a wholly-owned subsidiary of Tata Sons has decided to raise a $1 billion (Rs 4,700 crore) through Infrastructure Fund, by December 2009. TRIL, which focused on developing long-term infrastructure projects and large FDI (foreign direct investment) compliant real estate projects, intends to develop infrastructure and real estate projects amounting to Rs 20,000 crore within three years. In a significant move, country's largest outsourcing firm, Tata Consultancy Services (TCS) named N. Chandrasekaran as chief executive officer (CEO). Chandrasekaran will replace S. Ramadorai on October 6. It should be mentioned here that Ramadorai has been shouldering the responsibility as CEO of the IT company since 1996. He was appointed as the CEO and MD on August 9, 2004. At present Chandrasekharan is the chief operating officer and executive director of the TCS. Vakrangee Softwares, an e-governance service provider, has received a Letter of Intent (LOI) from Tata Consultancy Services Ltd. (TCS) for working as a build partner for six pilot sites. Under the Passport Seva Kendra (PSK) project, the locations are Bangalore (Lal Baugh), Bangalore (Sai Arcade), Mangalore, Hubli, Kirtinagar (New Delhi) and Gulbarga. The shares of the company settled the day with gain of 5% at Rs 48 on BSE. The counter has made 52-week-high and low of Rs 291 and Rs 19 respectively. 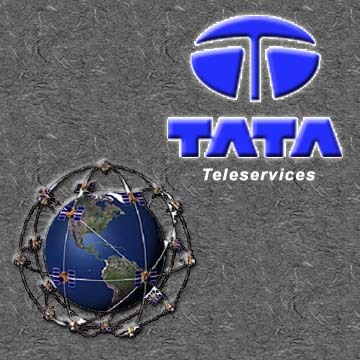 Tata Teleservices Ltd (TTSL), a part of the Rs. 2,51,543 Crore Tata Group, has entered into an exclusive partnership with Yahoo! India for providing online user interface to all Tata Indicom customers. Under the alliance, a co-branded Yahoo! India website would serve as the default homepage across all Tata Indicom internet access devices. The service will offer users the option to find relevant information on services like bill payment, tariff plans and promotions on the portal. Tata Motors Ltd, India's largest truck maker said that it has issued secured non-convertible rupee debentures to financial institutions, raising Rs 4,200 crore to bridge loan worth USD 3-billion the firm had taken to acquire Jaguar and Land Rover. The issue opened at 10 am and closed at 5 pm to issue debentures in four trenches, guaranteed by the State Bank of India, with maturity range between 23 to 83 months. Tata Motors, India's largest automobile company, has informed that it has successfully raised Rs 1,250 crore by selling non-convertible debentures (NCDs) to Life Insurance Corporation of India (LIC). According to a official release, the NCDs bear a coupon of 10%, and have a maturity of seven years. It should be noted that the debt is part of a larger fund-raising programme to refinance the bridge loan taken at the time of the Jaguar Land Rover acquisition. Rating agency, Crisil has already assigned a rating of stable to the debentures, based on the irrevocable and unconditional guarantee provided by the State Bank of India. TATA group-owned company, Tata Steel has informed that it has secured a loan worth Rs 2,000-crore from Life Insurance Corporation (LIC), India's largest financial institution. Under the arrangement, LIC will subscribe to Tata Steel's non-convertible debentures (NCD) that carry an interest rate of 10.5%. It should be noted that LIC, which already holds an 11.68% stake in Tata Steel, is the second-largest shareholder in the steel maker after the Tata Group. Sources revealed that the funds will help the world's fifth-largest steel producer make additional equity infusions into its UK subsidiary. Tata Capital Housing Finance Limited, a wholly-owned subsidiary of Tata Capital Limited has finally received certificate of registration from the National Housing Bank, to start business as a housing finance company. The company believes that floating a home finance company will give it opportunity to participate in the growing housing sector. Further, the firm said, that creation of a separate subsidiary will help it consolidate and focus on its housing finance business. The new company plans to offer both fixed and floating interest rates. Auto major Tata Motors Limited (TML) said that it would hike wages of its staff for 2009-10 despite unfavorable market conditions due to global slowdown. S Tambe, Vice President, human resources & corporate administration, TML, said, "There are companies that haven't given a raise this year but we are definitely looking at giving increments this year." However, the firm has yet to finalize the wage structure which would be in with single digit increase this year. Tata Memorial Hospital is in news these days for two reasons. Firstly it won the prestigious Jamalal Bajaj Award for 'best professional services in the healthcare industry.' Secondly it is under CBI scanner for a multi-crore scam. The CBI officials claim to unravel a 100 crore scam relating to smuggling of medicines. Officials claim that anti-cancer medicines from the dispensary attached to the hospital were sold to private chemists for a commission.